This could be a readable art object in its own right. The design has an eye to how paper magazines can re-use their editorial work without having to drastically change their workflow or add new teams. Maybe if the form is clear enough, then every mag, no matter how niche, can look gorgeous [and] be super easy to understand. Watch the demo; it’s fascinating. I’m eager to see where they go with this. There’s a discussion board over at Bonnier R&D Beta Lab, if you want to give them direct feedback. Calendar: Honestly, what is it about them that bothers you so much? Calendar: Computers don’t smell, Rupert. Giles: I know! Smell is the most powerful trigger to the memory there is. A certain flower or a, a whiff of smoke can bring up experiences… long forgotten. Books smell. Musty and, and, and, and rich. The knowledge gained from a computer, is, uh, it… it has no, no texture, no, no context. It’s, it’s there and then it’s gone. If it’s to last, then, then the getting of knowledge should be, uh, tangible, it should be, um… smelly. Heh. Who knows. Things are changing very, very fast for us right now. We are mid-leap. I just hope the future’s scratch n’ sniff. I’m planning to buy an ebook reader next year. Honestly I’m nervous about it. I love books, adore the texture of the pages, the weight and general sensory experience of reading a book. However I’ve just started a huge project that is going to have me consuming books by the arm load on a regular basis for a long time and I just don’t have the space/refuse to get rid of them. I’m thinking of getting the Black Sony Touch one because I can expand the storage to 15GB which should last me almost forever since book files are fairly small. Still, I’m dragging my heels at actually making the commitment and buying the reader. There is a very specific non-gimmicky reason why e-ink based readers work as flipped pages. e-ink displays (used by most current e-readers including Amazon’s and Sony’s) only consume electricity when they update their screen (for reasons that the wikipedia page on e-ink explains), maintaining a static page on those e-readers is not using any battery power whatsoever. This makes them very efficient power wise. I love print and I do not own an e-reader but once there is one I like for say under $200 I probably will. It will be pretty much exclusively used as a way to read stuff off of project gutenberg in a convenient and portable form. All that said the Mag+ does seem neat for many reasons. I think my Sony Reader is great. I can still use the Reader when watching TV after a day at work staring at a computer screen hurts my eyes. Plus: last time I moved a friend banned me from literacy because of all the books I needed help carrying, so one device which can store a library’s worth is very welcome. If only everyone would sell their books as ebooks. The screen does not look pixelated, and unlike a computer monitor or TV, the screen is not constantly being redrawn. The only time it really draws power is when you flip a page, so battery life is measured in days or weeks rather than hours – more than enough time for me to get through multiple books. This is also the source of what you called an “abhorrent digital gimmick” – flipping pages occurs because the redraw time is too slow to effectively support scrolling, but does not interrupt the flow of reading any more than, say, turning a page in a book. I don’t have any wireless stuff in mine, which would probably drain the battery quicker. I plug mine into the computer to get books – and it’s nice to be able to get something new to read in the middle of the night, or when I see a blog post about a book that sounds interesting, or even when the weather is just lousy. I find that people who are afraid of digital book readers because they don’t want to stare at another computer monitor while reading have just never even seen one in person – because it honestly is not like that at all (they may end up hating it anyways, but at least not for a fault that does not exist). If anyone out there has not interacted with one in person before, Sony Stores usually have theirs on display – it’ll get you a good idea of just what the deal is with these things. Despite my tendency to love book as objects a little more than is healthy, I adore my Sony E-Reader. Some books really don’t have a lot of effort put into their design, so I don’t really see a loss when they’re reduced to just text. I still buy a lot of books, though, mainly from McSweeney because the effort they put into the design really makes owning them as objects esssential. Plus it’s safer to read them in the bath. I’ve mostly been buying comics lately, and reading comics on a screen stinks. I have no desire to read books of any kind on a screen, though I bet it would be super helpful for students who have to lug their books back and forth to class. Leaving your books at home and carrying a digital copy to class would be awesome. Still, I think an e-reader will prove to be an profoundly useful and liberating tool for me in the very near future. I travel extensively, read voraciously, and recently had to put my entire library in storage. So once the price is right, and the tech is a bit more refined, I’ll be getting one for sure. Related note: what’s the latest update on Amazon’s file deletion policies? As of last summer, I was seriously debating a Kindle until the (oh-so-ironic) Orwellian “Big Brother” incident (Amazon was arbitrarily removing purchased files of 1984 from people’s Kindles, in certain cases, erasing student’s notes along with them!) Has that been sorted out yet? Call me crazy, but it really looks like they haven’t invented anything, just post-production edited some images onto a box. DVA, dunno if you’re crazy, but you are ignoring the stated fact that it’s a prototype project. That is, it’s an idea, not a finished product/invention. I’ve been considering the iriver ebook, because it can view word docs, excel spreadsheets as well as not being DRM limited like the kindle – the same reason I didn’t go for the ipod way back. However I think that if the tablet pc thing takes off next year I would probably go for greater functionality over the current state of e-ink. It’s a shame that the manufacturers of these tablets didn’t (to the best of my knowledge) agree on any kind of type-setting language. In fact that is a shame that everything isn’t built on something like TEX e.g. word documents being underpinned and exportable to tex formatted document that could easily be converted to pdf without something like pagemaker. In the end as interesting as design agencies thinking about interaction is – it’s standardization of the method of representing or transmitting data that makes technologies take off e.g. mp3 – not the best compression format but ubiquitous, html, mpeg2 for DVD etc. I have a Sony Pocket Reader and LOVE IT. I really love being able to slip it into my (medium-sized) purse to read something long (I’m currently working through the Dune books) on my lunch breaks at work. I haven’t traveled with it yet, other than weekend visits to Dad, but I’m sure that not having to carry a bunch of heavy books will be awesome. I won’t say it’s perfect by any means – reformatting books can lead to some issues, footnotes are an issue, and so on – but it’s great for what it is. @Mer – Amazon apologized profusely and said they won’t do it again without a court order, in the case you ask for a refund, or the book is somehow malware. I have a Kindle, and I’m happy with it. There are still books I buy physical copies of for fetishistic reasons (Pratchett, say), and the inability to loan them out is problematic. But there are ways around the DRM, and not having books pile up is a good thing. Yes, rebuying books I’ve already paid for is annoying, but then again, I can now carry my favorite authors anywhere I want to without having to bring a wheelbarrow. I wish it worked for comics too, but that will come some day, I hope. @kevin and Encaitare – I actually find reading comics to be ok on the Sony. @Nick – I find it okay to read comics on it as well, but only okay. I’d rather read it as the actual physical object, or at least on some other device. The length of time it takes my reader to redraw the screen for images is long enough to bother me, and unless the original material is prepared for a manga-sized volume, the text can be too small to be read easily. Honeslty I would love this type of thing for say the vast quantity of roleplay game books I have (they weigh a ton when in a box and you’re moving house) and it would be ideal to have all my copies of scientific papers on there to read and search through when I am researching or writing a paper and need to cite the correct papers. I dunno I’m with the hard copy crowd. I prefer the look, touch and smell of books. Besides, Books are those things that bring about fellowship. I remember buying a new book and then passing around to friends to read at lunchtime, trading them. Also machines like kindle are a sort of status marker. They can only be used in industrial countries with access to hardware. A child in a third world country with no electricity or internet access can enjoy Tolstoy by the light of the candle on the dirt floor of a hut. Even it gets wet or stains a little, the information is still there, sometimes for centuries to come. How long do electronic media devices last? roughly a year or two. Then they have to be replaced and all the information repurchased. This happens to me constantly with mp3 players. I keep hard copies of most things I want to have access to. I suppose I’m crazy but I love old things and all their history attached to them. I’m one of those people that don’t throw things out just because they aren’t new and flashy anymore. The tears in jeans, the patches on old clothes, old tables and chairs old vinyl records, lamps and suitcases I think we’d spend a lot less money if we savored the things we had instead of going out to buy new things every two seconds. I’ve been waffling on an e-reader for ages. I’d love to read comics on them, and for travel, i’d much rather be able to bring a number of books with me in a neat package. I love the concept behind the interface on the Mag+- that’s for sure. The video isn’t working very well for me, so I only have the description to go on…is it like microfiche? That’s how it’s coming across. I could see that being useful for articles, academic journals and so on, but otherwise I’m still amongst the hardcopy people. I’m trying to break into publishing now, and having interned at publishing houses, etc., there’s just something so magical about the vast quantities of books that we’ve published lining the shelves. I love the texture of the pages and ink, I love the galley proofs, and the mock-ups. I can’t see using an e-reader myself. i love the feel of books, and i love that you can carry them anyplace and not worry (too much) about something awful happening to them. you can bang them up a bit, and you can fall asleep with them, and you can let friends (permanently) borrow them. i do have a a lifelong fantasy of one day owning a glorious library, with shelves that go up high and rolling ladders to access them all. secret, false books that have treasures hidden away. maybe a book that serves as a lever to a door that leads to a secret passageway. i’m still a sucker for the romance of the paper book, just like i love to have cd’s of albums, so i can peruse the art and read the tiny liner notes, and disassemble the jewelcase to see if there’s anything clever hidden in it. but i appreciate the digital age for its potential to eliminate waste as well…e-media will be the way to go, if/when i ever make enough money to go that route. as for now, i’m just in limbo between the physical and the virtual. I’m currently doing some postgraduate academic research, and I’m very tempted to use an e-reader – not only to lighten the load of books that I’m carrying around, but to help me deal with the stack of PDFs that I need to chew through at some point. However, there just isn’t a good solution for converting formats yet. The problems with digital formats are another huge strike against getting one of these devices – especially buying the kindle outside the US. Perhaps digital editions will somehow become more attractive in the future, but the publishing industry seems to be running scared after what they saw happen to their friends in the music business. I just got a regifted Kindle for Festivus. I’m pretty sure I’ll be returning it for store credit. Imagine how many used paperbacks that’ll get me! 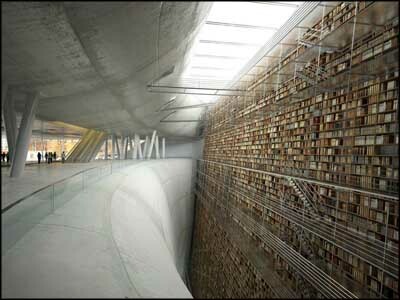 Also: The ‘wall of knowledge’ design is simply breathtaking! I want to go to there!